The Lucky Galah is available from bookshops across the land and from online booksellers (Booktopia, Amazon). It’s also available as an eBook and an audio book. It’s 1969 and a remote Australian coastal town is poised to play its part in the Moon Landing. An influx of expat NASA employees working at the tracking station on the sand dune just out of town shakes things up. A pink and grey galah cockatoo emerges from a cage at the back door of the Kelly household and uncovers some tightly-held secrets. She threads these playfully through the story of her own rising and falling fortunes in what we call the lucky country. 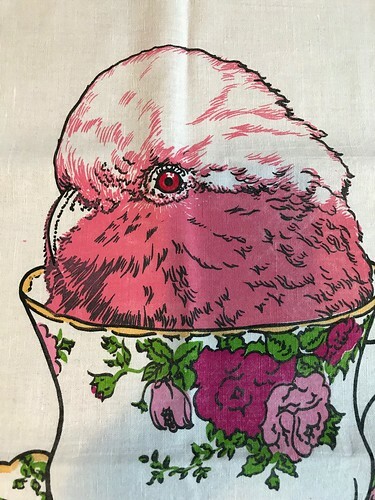 As I wrote The Lucky Galah, I had a vision: I imagined it would go nicely with a matching tea towel. With help from local Bathurst artist Katrina Daly, this ambition has been realised. You can order (directly from me!) a hand screen-printed tea towel to go with your book! Send a message to tsoren@tpg.com.au. They’re $20 each. The book was launched by Books Plus in Bathurst on March 10, although it had been out in bookshops for a couple of weeks by then. I’ve done author talks at the Leaf bookshop in Melbourne; in Carnarvon at the Space and Technology Museum and at the town library; at Better Read than Dead in Sydney and at Charles Sturt University in Bathurst as part of the local outpost of the Sydney Writers Festival. I also spoke in Canberra at Paperchain books and Springwood in the Blue Mountains, both in June and in Hobart Fullers Bookshop in July. There’s the good, the bad and the ugly. The most important thing is that people have noticed that this book exists and they’ve said or written stuff about it. That’s huge for this little pink and grey galah. So everything else is a bonus. That said, I’ve had mostly good reviews but it’s the odd bad one that tends to get lit up on the horizon in giant letters, throbbing sickeningly through my day. But I cope! I wake up the next morning and go on! I’m intending to post links here to some of the reviews – stay tuned. I’m selling tea towels! These beautiful hand silk-screened tea towels are 50% cotton, 50% linen (fabric made in Russia; drawing and silk-screening by Bathurst artist Katrina Daly). They’re $20 each inclusive of postage and packaging, within Australia. Contact me on tsoren@tpg.com.au if you are ordering from outside Australia, as postage may vary. I loved The Lucky Galah. Could you please list high up in your blurb on your novel any awards it’s been nominated or long or short listed for? I’d really like to know and have it clearly on your site .. I noticed at this link: https://www.readings.com.au/the-readings-prize-for-new-australian-fiction that The Lucky Galah has made the Reading Prize for New Australian Fiction 2018 shortlist. I just finished the book and enjoyed it very much but .. what does the equation at the end mean? Hi Fran – I’ve sent you a personal email. I like to preserve a sense of mystery! But there is an answer to your question, and I’ve sent it.